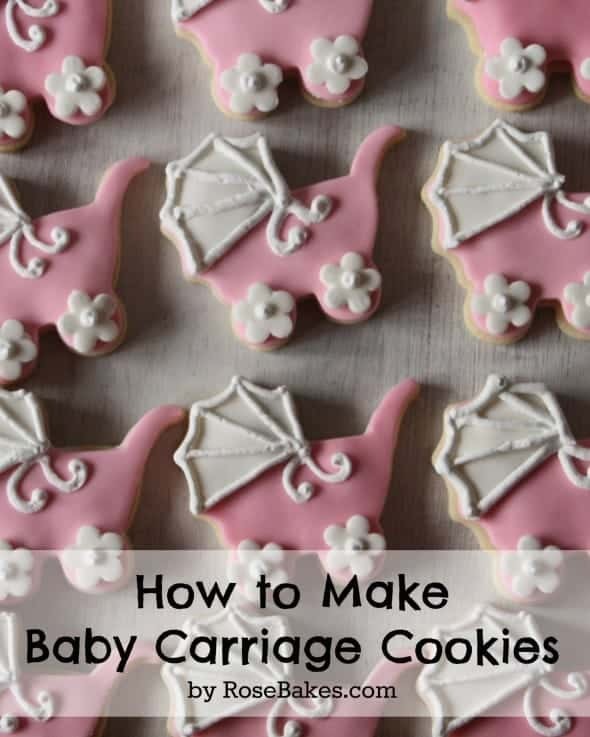 Before anybody gets too far and gets disappointed, this is a “words only” tutorial on How to Make Baby Carriage Cookies. These cookies are not hard at all, so I thought I’d write how how I do them, include links to everything you need, and of course, answer questions in the comments to help you out if you need it! Buttercream. I use vanilla buttercream. Fondant. I use homemade marshmallow fondant. You could do pink for girl, blue for boy, yellow or white or green for gender neutral. Whatever color suits your fancy! Royal Icing. Here’s the royal icing recipe I use. Icing bags with #3 frosting tip and a larger round tip, like a #8 tip. Flower Cutter. I used the largest plunger cutter from the Wilton Gum Paste Flowers set. Any simple flower cutter that’s about 1″ in diameter should work. Step 1: Bake the cookies & let them cool. Step 2: Use a large round tip and pipe buttercream into the center of the cookie. Spread it out a little with the spatula but not all the way to the edges. Step 3: Roll out the main color of fondant and use the cookie cutter to cut out the shape of the carriage. It’ll fit perfectly on the cookie! That’s one reason I love this recipe – it’s delicious, soft, and doesn’t spread or rise or lose it’s shape! 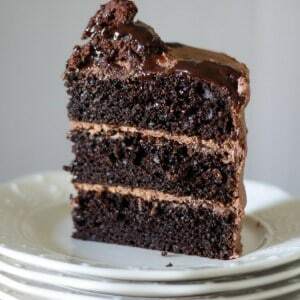 Once it’s cut lay it on the buttercream and smooth it down. Step 4: Roll out the white fondant for the baby carriage top. Use the cutter to cut out the shape for the top (canopy) part of the cookie. Use the pastry wheel to cut a smooth line there. Attach it to the first layer of fondant with a small amount of royal icing. Step 5: Cut out small flowers for the wheels. Attach them with royal icing. Step 6: Pipe the outline for the canopy of the carriage and the centers for the wheels with royal icing. Step 7: Let them dry several hours! And that’s it! These cookies are a little time consuming but not at all hard and always a crowd-pleaser! You can see the first time I made them here along with a matching Pink & White Baby Shower Cake! 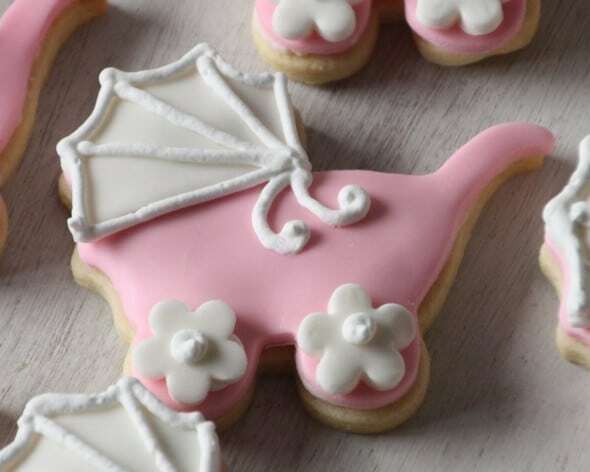 Do you have any questions about making these baby shower cookies? If you make them, I’d love for you to share the pics!